Pensa is a leading innovator in autonomous perception systems for retail inventory visibility. Its system uses breakthrough technology –including artificial intelligence, autonomous drones, and computer vision –to see and understand what’s on store shelves, providing crucial data to minimize stockouts, optimize product planning, and boost revenues and profitability. Pensa is also partnering with top retailers and CPG brands globally to address a trillion-dollar “blind spot” at a critical time for the retail industry. Inventory visibility is an age-old problem for brands and retailers, and it is only getting worse as e-commerce and physical store shopping combined. Industry studies report nearly one in 10 items as missing the shelf or misplaced, leading to lost revenue, dissatisfied customers or excess inventory. Pensa’s breakthrough approach uses computer vision to “see,” patent-pending artificial intelligence to learn, analyze and conclude, as well as agile, autonomous drones as roving eyes to automate high-value visual tasks for the first time. 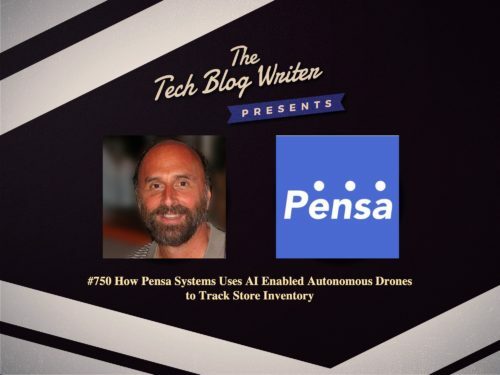 Pensa is also the first company to deliver a broadly scalable system that provides complete, real-time and actionable data and insights, enabling consumer packaged goods (CPG) brands and retailers to automatically and systematically track in-store inventory. Early trials with major consumer packaged goods (CPG) brands and retailers have shown more than 98 percent accuracy, at a lower cost than other approaches. I invited President and CEO of Pensa Systems, Richard Schwartz onto my daily tech podcast to learn more. He has repeatedly created and led new organizations to innovate and develop software that has had a significant market impact. As Pensa Systems emerges from stealth, I invite you to join me in finding out more about this exciting technology.